I hope my co-teacher doesn’t see this. But in case she does, I’ll say here what I’ve already told her and the other pre-calc teacher with whom I share (virtual) classroom space: They do a superb job at teaching students and accommodating my lack of mathematical prowess. They are amazing teachers, and the most wonderful co-teachers anyone could ask for. They are top notch people who love students and love what they teach. Which is to say, they love math. I do not love math. But I do give the math teachers that I have co-taught with high marks for moving me into a space where I don’t hate it. Much. This is high praise, considering where I started several years ago. 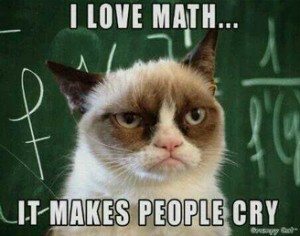 I have almost always hated math. And most of my caseload students hate math as well as most of my fellow special education teachers. Fleeing a math-intense curriculum is one reason many of us became special educators. We loved teaching, and loved kids and some of us even loved science. But we hated math. I’m currently lobbying to create and sponsor a “I Hate Math” club for our school. The idea is to have a club that is like a support group akin to those support groups for people having to go through chemotherapy. We don’t like it, but we have to do it. We have to endure, and we have to survive. And we can do it much better if we do it together rather than fall apart. We can become math survivors. I’m pretty well qualified for such an endeavor because not only do I have a lot of anxiety, fear, loathing and anger toward the subject, I’m also somewhat compelled to be around it more than I would like. Which is to say, almost all the time. This describes a lot of the students I encounter in our schools and in my own family. Outside of math teachers, engineers and a few other oddballs, I’m very hard pressed to to find people who really and truly like mathematics. There are a few of us who like logical thinking and may enjoy an occasional mathematical puzzle (Sudoku anyone?) but when we start talking about calculating slope, synthetic division, imaginary numbers, cosines and radians we start entering that dark distasteful zone that begins putting people off. It can even have many of the same symptoms as anxiety due to chemotherapy. I’ve talked to students who became physically ill every day before entering their math classes. Math phobia is a real thing to many, many students. Almost every school teacher could identify to this on some level, but math teachers are especially vulnerable to being abused by students who hate their subject. I might have abused a math teacher or two in my own way back in the day. And right now, wherever they are, they are having a wry smile at my expense. I would never have predicted that I would be near a math classroom at any time after graduation and now I get to endure much of what my old math teachers did. But for all my discomfort with the subject during my own middle and high school years, it is no where near what today’s students are being subjected to. The above is an image of the math curriculum for a school in another state, but closely matches what is in place in the state of Georgia and several other states. By the time a student is in 11th or 12th grade, they are expected to be taking either pre-calculus or calculus. For those of you with children in school, let that settle for a minute. There is no alternate plan here. This IS the state curriculum. Recently, the state of Georgia did announce a change in its sequence that does offer a less daunting option and you can see the pdf here. I will applaud a move in the right direction, especially for our students with disabilities. However, Algebra II is still required in order to get a high school diploma in the state of Georgia. And where is consumer math? The odd thing about this report is that it is written in support of the Common core Curriculum which puts me in a very odd place. I’m not a fan of the Common Core, largely for reasons that you can watch in this documentary on the subject. I have experience with this on 3 different levels: as a person who is mathematically challenged, as a parent and as a teacher of students with disabilities. As a person who was difficult to motivate during his middle school years, especially in the area of mathematics, I am very thankful I grew up when I did. Namely that I was not required to master Algebra II in order to graduate high school or even college. If that were the case, I would not have a college degree, let alone a Master’s degree, and it might be doubtful I would have gotten through high school. I would have done what I see more and more of the students that I teach do: I would have quit. I have no doubt in my mind that I would have taken this option. I started out well enough, getting an ‘A’ in my first quarter of Algebra I. Next Quarter I got a B, and then I got a ‘C’ and then I got a ‘D’. In Geometry I started with a ‘B’ my first quarter, then a ‘C’ and then…well I finished the second semester with an ‘F’. A lot of this was due to motivation, but in those days there was an option to make up that math credit by taking business math, which I did. It was a class that was infinitely more fun and practical where I learned about amortization and interest rates and where I was the one to figure out how to program the school’s new Apple I computer to do my homework. I loved computers back then and taught the thing how to calculate my interest homework. Visicalc hadn’t been invented yet, or at least no one I knew had heard of it. Now I have a son of my own who, unfortunately, has inherited his father’s rich loathing of math. But he has a more determined mother than I did, and he’s probably going to finish with an ‘A’. However that ‘A’ in Algebra I is probably taking 10 years off of my wife’s life in the form of all the frustration and the constant strife and battling. He still has 3 more years to go and at this rate, I might need to put an extra life insurance policy on my wife. At the very least, I’m going to be bound to staying in a job with good health insurance. Like so many of my students, my son has modest goals for his future. If he were 10 years younger, he would not even be on track for a regular education diploma much less doing and succeeding in algebra I. In this way, inclusion has been a good thing for many students and does challenge and offer them a good education. However the focus on college readiness is going to doom a lot of the students who have less determined or educated parents. He could learn and be very good at a trade and really that’s all he wants to do. He wants a good job that allows him to afford his appetite for all things having to do with model railroading. However, there are very few vocational programs in high schools anymore. The arts have also been marginalized because of the pressure generated by the testing culture. The bottom line for many of our students is that the bar for a high school diploma has been raised to such an extent, especially with the math curriculum, that too many of them are not going to make it. They will get discouraged and quit all because of a barrier that has been put in place needlessly. According to the NCEE study, less than 5% of all students will require much more than Algebra I in order to function well in their jobs and careers. I’m currently engaged in a bit of a battle, trying to save as many of my students as possible, and enable them to reach that finish line. They want to be mechanics, welders, seamstresses, healthcare workers, hair dressers, farmers and truck drivers. These are all skilled positions and careers where they will need some additional post-secondary training. But in order to get that they are faced with a stark and scary road that leads through Algebra II and possibly pre-calculus. They struggle massively just to make it through coordinate algebra, which is even harder than the algebra that I had in 9th grade. The pass rates on the End Of Course tests in math in the state of Georgia are absolutely dismal, with 60-70% of all students taking the exam failing it. For students with disabilities, the failure rate is closer to 90%. There is a provision for students with disabilities in Georgia to follow an alternate curriculum that can rescue them from the Algebra II trap. However, there seems to be some question among some districts as to how to apply this, and some are very slow in applying it. In the meantime, the river of students continues to flow through the system and many of them are opting out by dropping out. Applying this rule fairly early on when it is obvious to the parents, the student, the teacher and the IEP team that this student will quit or fail school before succeeding in Algebra II can give them an early lifeline in helping to persevere through the rest of the courses. Knowing that there is an end point that doesn’t have to end in a needless mathematical death march can help keep the doors open for many of our students.